Swine equipment manufacturer targets greater animal comfort with new products. January 16, 2013 – Osborne, KS – Osborne Industries, Inc., has added new flooring options for swine confinement buildings, in conjunction with the company’s “Single Source Swine Solutions™” – an innovative line of swine management products, equipment, and services for the global pork industry. Plastic and galvanized steel flooring for nursery and farrowing allow Osborne greater customization in its livestock equipment and building packages. Interlocking plastic flooring provides firm support for growing animals’ legs and feet. 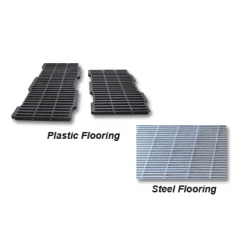 The plastic composition of the flooring naturally feels warmer, which is especially important to growing pigs in nursery buildings, because the animals can use less energy to produce extra body heat. Like Osborne’s plastic flooring, the new galvanized steel flooring for nursery or farrowing buildings is designed to foster animal comfort. Leg issues are lessened or eliminated owing to the bar spacing pattern in the flooring. It is easy to maintain and clean – there is absolutely no woven wire, which often rusts early due to hard water and manure buildup. Custom-designed recessed areas in the flooring allow for installation of Osborne’s Stanfield® Heat Pads, making the heat pads flush with the rest of the room. In farrowing, a revolutionary two-piece self-supporting cast iron system under the sow provides stability and sure footing for the sow. Osborne’s new nursery and farrowing flooring is custom designed by Osborne engineers to increase efficiency in modern pork production. “For nearly 40 years, Osborne has been an innovator in the pork industry, and by now offering specialty flooring to our customers, we can provide a full-line of swine equipment and services. From conceptual farm design to offering each component of modern production facilities, we can deliver it all,” said Tom Kober, Vice President and Chief Financial Officer. For more information about Osborne, its new products, and its innovative “Single Source Swine Solutions,” visit osbornelivestockequipment.com or e-mail info@osborne-ind.com.